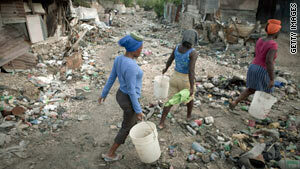 Women walk through a garbage-filled ravine in quake-Petionville, Haiti, on Wednesday. U.S. Secretary of State Hillary Clinton pledges $1.15 billion on behalf of U.S.
(CNN) -- A broad array of international donors pledged nearly $10 billion in long-term assistance to Haiti's earthquake recovery efforts during a daylong conference at United Nations headquarters. U.N. Secretary-General Ban Ki-moon opened the conference, titled "Towards a New Future for Haiti," by urging the more than 100 donors in attendance to provide $11.5 billion over the next 10 years for the reconstruction of the island nation left devastated by a 7.0-magnitude quake in January. "What we envision, today, is wholesale national renewal -- a sweeping exercise in nation-building on a scale and scope not seen in generations," Ban said, according to the United Nations. The January 12 earthquake killed more than 200,000 people and severely affected the lives of 3 million more. Many are homeless and in dire need of food, clothing, shelter and health care. More than $5 billion of the $9.9 billion pledged Wednesday will be used for immediate recovery efforts over the next 18 months and will be administered by an interim reconstruction commission co-chaired by former U.S. President Bill Clinton and Haitian Prime Minister Jean-Max Bellerive. "The rainy season is fast approaching," Ban said in appealing for immediate funding, according to the U.N. "Some camps for displaced persons are at risk of flooding. Heath and sanitation issues are growing more serious." U.S. Secretary of State Hillary Clinton, in her opening remarks to the conference, pledged $1.15 billion on behalf of the United States but warned the path toward recovery will be a long one that requires lasting commitments from fellow donor nations. "We cannot just declare our intentions," she said. "We have to follow through and put them into practice. Therefore, this is not only a conference about what financially we pledge to Haiti. We also have to pledge our best efforts to do better ourselves -- to offer our support in a smarter way, a more effective way that produces real results for the people of Haiti." The United States was one of more than three dozen nations to pledge their support, including Venezuela, Australia, Luxembourg, Canada, Chile, Denmark, Ecuador, Norway, Gambia, Slovenia, Oman and Japan. Ban praised the fundraising effort in his closing remarks, saying, "This is the downpayment Haiti needs." "Today, we have mobilized to give Haiti and its people what they need most: hope for a new future," he said. "We have made a good start, we need now to deliver." Donations will be tracked via a public, Web-based system to ensure transparency and accountability, Ban said. "We must make sure Haiti gets the money it needs when it needs it. And we must guarantee that it is well-coordinated and well-spent," he said. Also Monday, Ban named Edmond Mulet as the U.N.'s special representative in Haiti, replacing Hedi Annabi, who died in the quake. Mulet has been the interim special representative since Annabi's death. He will also continue his work as the head of the U.N. Stabilization Mission in Haiti (MINUSTAH).